1. 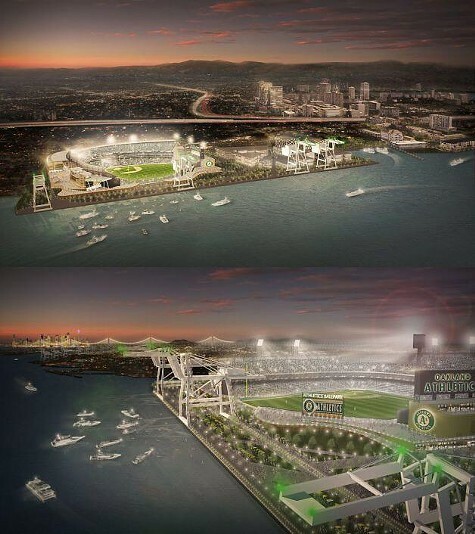 A coalition of Oakland business leaders and A’s boosters have put together a $500 million plan to build a new ballpark for the team at Howard Terminal along the city’s waterfront, the Chron reports. Leading the effort, which has the backing of Mayor Jean Quan, are Clorox Chairman and CEO Don Knauss and T. Gary Rogers of Dreyer’s Grand Ice Cream. The Save the A’s coalition also includes former city Planning Commissioner Doug Boxer and Michael Ghielmetti of Signature Development Group, which is building a massive housing development not far from the proposed ballpark. The stadium would be just west of Jack London Square. 2. Audubon Society bird watchers said their annual East Bay bird count was surprisingly low, the Chron reports. It’s unclear whether the lack of birds in the area is the result of climate change, the recent cold snap, or some other issue. The environmental group plans to announce its national findings in January. 3. At the request of Governor Jerry Brown, the Obama administration has reversed course and decided to declare the Rim Fire area near Yosemite National Park a disaster area, thereby releasing federal funds, the SacBee$ reports. Earlier, the administration had denied the disaster declaration. The Rim Fire was the fourth largest in California history and destroyed the popular Berkeley Tuolumne Family Camp. 4. The University of California reached a tentative deal with one of its largest employee-unions, which represents more than 12,000 technical employees, researchers and health care professionals, the Chron reports. 5. And the Contra Costa County Coroner’s Office has concluded that two BART workers killed when struck by a train in October failed to abide by a worker-safety rule that the transit agency has since discarded, the CoCo Times$ reports. The NTSB has not yet finalized its investigation.